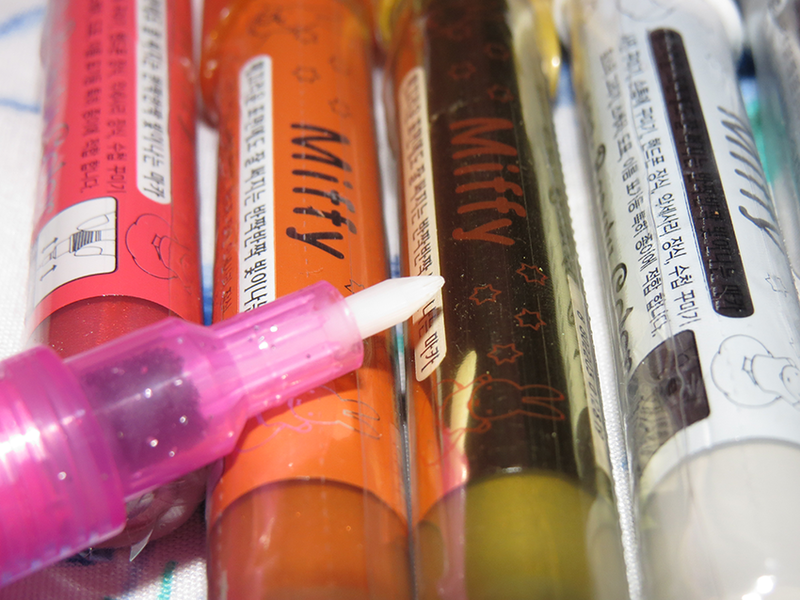 review: miffy instax writing pens. super fair price, the seller i got it from gave free shipping! now, the pens come from korea, directly. so it is a bit of a wait. i ordered these pens on december 23rd and didn't received them until the 8th of january. that's two weeks (not counting non-business days). plus, there's no tracking number so you don't know where your package is. however, the seller from where i bought mine is reliable, it's actually not that bad of a wait, considering that they're traveling from korea to the us. the pens have a sharpie-like smell to them. but as always: you can't really smell a thing unless you put your nose directly to it. the miffy pens come in the colors white, silver, gold, red, pink, purple, a light blue and a dark blue, orange, and green. that's 10 colors in all. the two flowers on the bottom right-hand corner are both the two shades of blue. they look very similar irl. 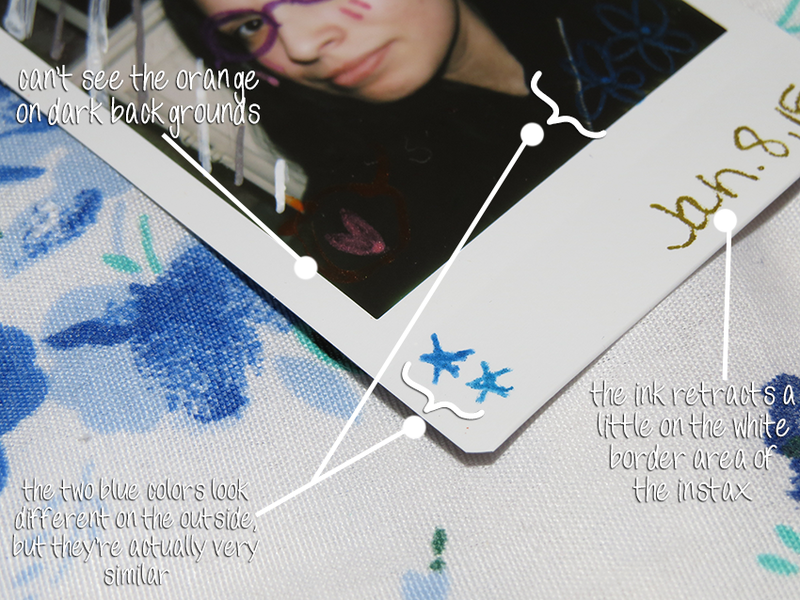 i even did a test on the white border of the instax (the stars), just to be sure, you can see the difference in color, but only slightly. 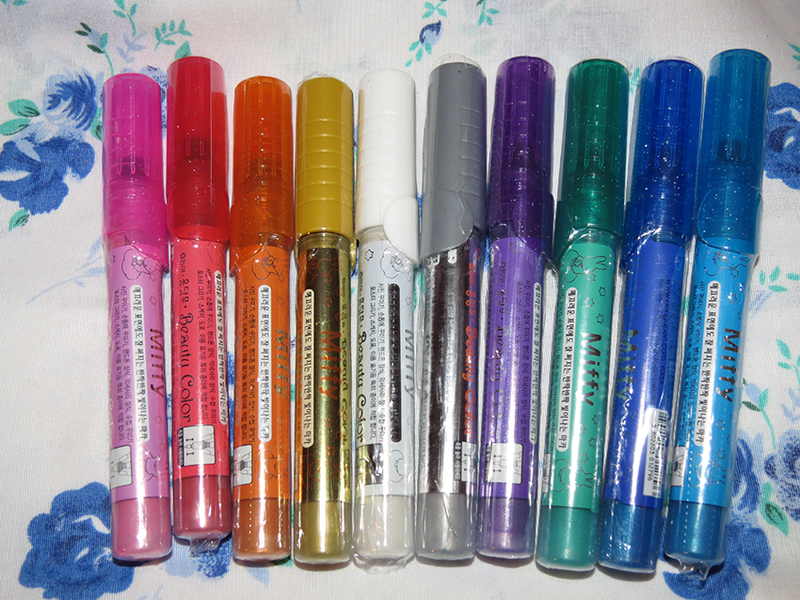 all of the pens, except for the white one, are metallic. unfortunately, i didn't get them with the original case, so i'm kinda sad about that. :/ however, all of the pens came with the safety seal still intact. the pen capsule is clear, so you can see how much ink is still inside, which i really like. also, you have to be really careful when putting the cap back on the pens because if you do it too roughly, you could potentially damage the tip. 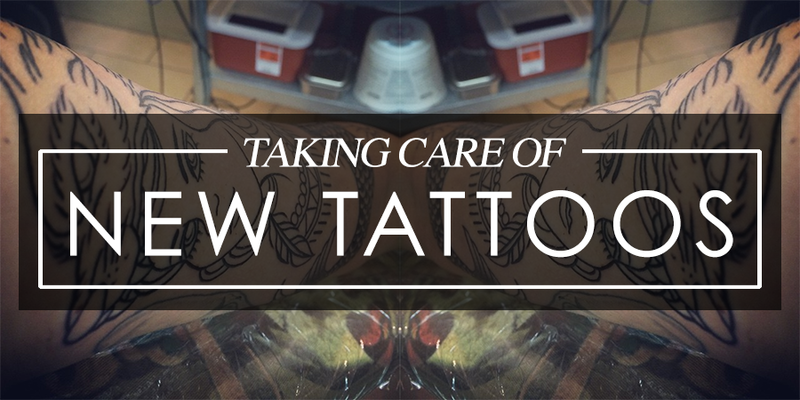 from what i can tell so far, you have to shake them after a couple of minutes for more ink to come out. you have to shake them vigorously for about 30+ seconds on the first use for the ink to come out. press gently. and since i had to use all of them to give you guys examples, my arms hurt after the first few, haha. the ink will retract a little on the white part of the instax photo (it's the gold color below). also i would wait about 5 or so minutes for the ink to dry to that it doesn't smear. also, one the red pen, the tip came out so i had to push it back in. though there are a few setbacks with these pens, they're still very cute and useful. 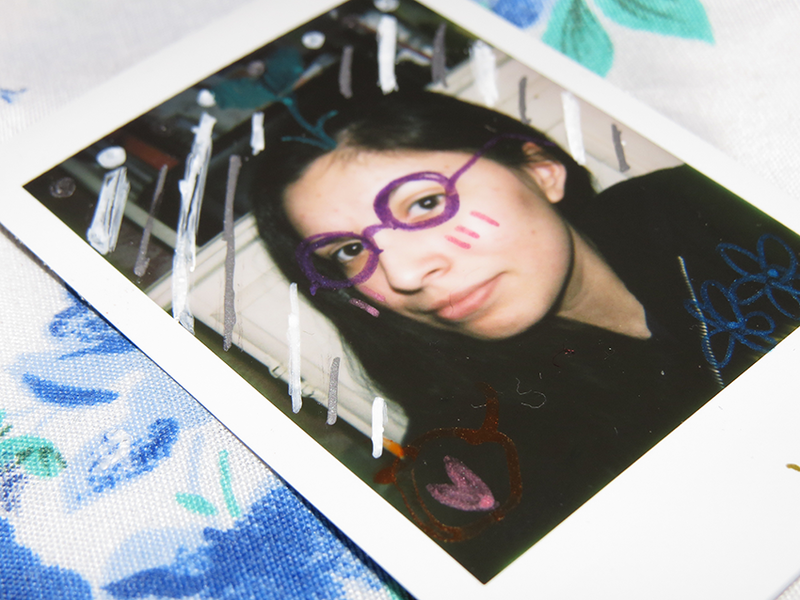 i love decorating my instax, so i know that my money won't go to waste with these! please ignore my face, haha.